OnSite (2009) explores the construction of Hybrid Reality Games (HRGs) for entertainment and educational purposes. HRGs are location-based games that take place simultaneously in two spaces: a digital online space and a physical environment. 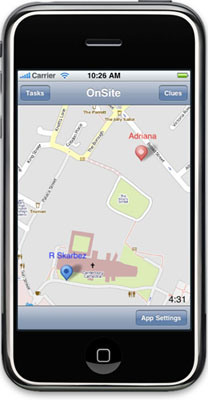 Equipped with GPS-enabled mobile phones, players in a pre-chosen physical location access location-based information about that space and interact with online players through text messages and voice communication. At the same time, online players track the real-time movement of physical players on an online map that represents the physical location while communicating with the players in the physical space. The collaborative and real-time coordination of HRGs make them especially suitable for educational contexts, as well as other situations that require remote and local networked interaction. Joyce Rudinsky, domain scientist for the arts and humanities at the Renaissance Computing Institute.